1. Where should a teacher in a SPED environment start? We suggest each teacher start by defining the starting point for each student via the customization and assigning of a Learning Path. A Learning Path is simply a set of standards you would like your students to work on and ultimately master. This can be as short or as long as you desire. However, we recommend that students work through shorter learning paths aligned to IEP goals as an example. Research shows that students with significant knowledge gaps benefit from seeing an end to their path. It motivates them and also keeps them focused. 2. How does ScootPad identify knowledge gaps? Efficiently! ScootPad detects when a student is struggling and automatically scaffolds content in real-time providing the student with timeout lessons and practice in prerequisite concepts. This automatic REMEDIATION happens with no involvement from the teacher and seamlessly within the students’ adaptive practice. In one adaptive practice session, a student could receive questions from several concepts based on their level in the Learning Path! The scaffolded concepts from the students’ Learning Path will appear orange on the Adaptive Practice dashboard. TIP: Scaffolding will only happen when students are in a Learning Path so you would want to make sure you have Adaptive Practice enabled. 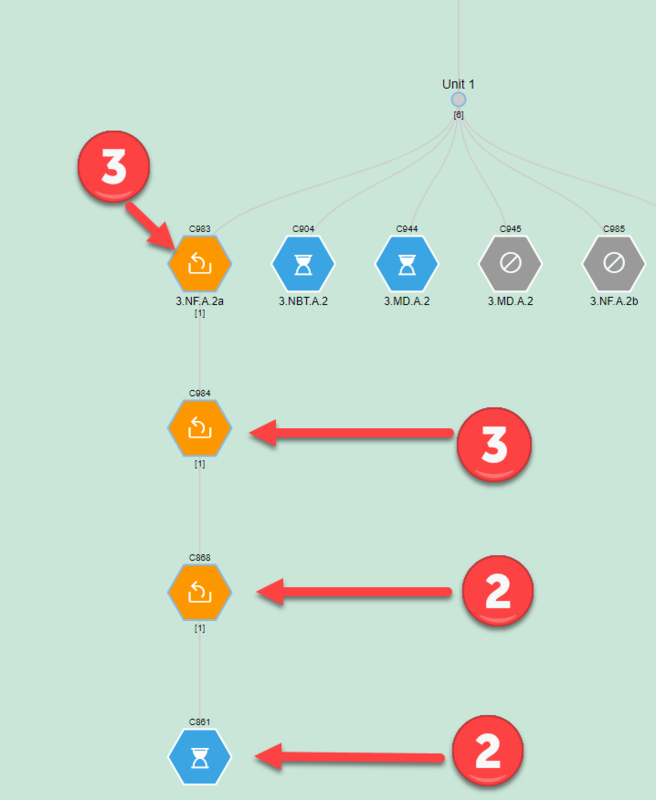 Below we show you 1) how to navigate to the dashboard to identify students receiving automatic remediation 2) how to unpack the concepts to reveal the levels of scaffolding and 3) how to review this information broken down by the domain the concepts are in or the Mastery Score view. 3. How far down does ScootPad scaffold? ScootPad will scaffold as many grade levels as necessary (going down as far as Kindergarten concepts) in order to fill skill gaps. 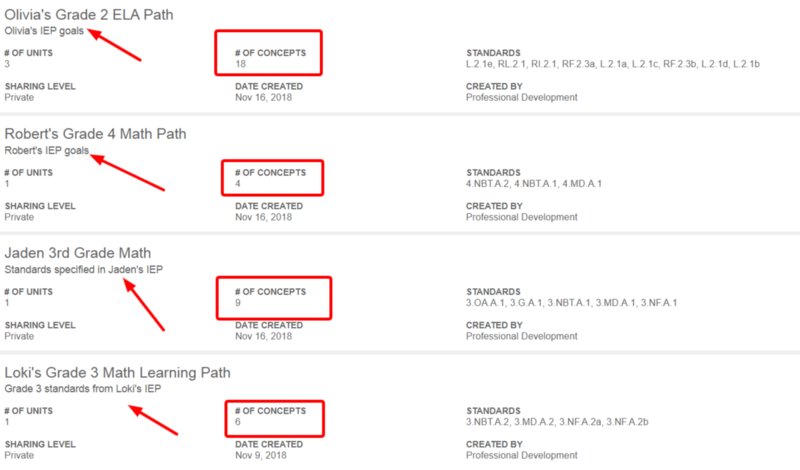 When you review a student’s Learning Path, you’ll see the concept(s) being scaffolded (in orange) and the prerequisite concepts (connected by a line leading from the original concept) which have been automatically offered to the student during adaptive practice. ScootPad will work on filling skill gaps in the prerequisite skills while gradually exposing the student to more challenging content. We will eventually re-present the student with the original concept from their learning path. Below, the student’s original Learning Path concept is shown as a 3rd grade concept. As the student continues to launch adaptive practices, ScootPad uncovers the skill gap which leads down to a 2nd grade concept. 4. How would a teacher in a SPED environment monitor progress? The teacher can assign one of our pre-built simulation assessments, entry-exit tickets, or simply build their own assessment, aligned to the specific IEP goal, in order to have students RECALL knowledge. Assessments in ScootPad look identical to a practice session and is the BEST way for you to see growth in your students over time. Pull an assessment report and ScootPad plots student data points in an easy to read bar graph format. This is great to stick in a student portfolio. Plan your RTI interventions using ScootPad assessments and monitor student progress daily if necessary! 5. How can a teacher tell if a student has mastered concepts or needs additional assistance? From the adaptive practice dashboard, teachers can see the status of each concept in the Learning Path. Concepts which are in progress are blue, concepts which have been scaffolded to prerequisite concepts are orange, and concepts which have been practiced significantly over time and the student has passed them are turquoise. These 3 statuses indicate that the student is working independently. 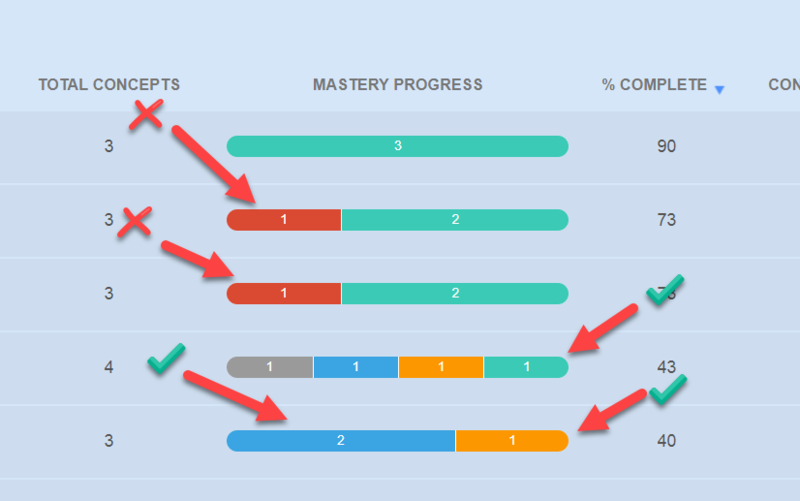 When ScootPad exhausts all available resources, and determines a student and/or concept needs re-teaching from the teacher – this is when you’ll see concepts in the Learning Path in red and marked as needing “Intervention”. You’ll find such detail on the adaptive practice dashboard and also by launching the RTI-aligned Intervention Monitor. The Intervention Monitor provides a brief snapshot of students requiring re-teaching in both Math and ELA concepts. Launching the Intervention Monitor will provide a 2-dimensional grid view (aligned to the RTI framework) to help you quickly identify and implement your re-teaching and intervention strategies. Once you have re-taught the concept, you can quickly assign an improvement practice to assess if the student has shown improvement and can move ahead with other concepts warranted in their IEP! 6. How do students drop off the Intervention Monitor? Students drop off the Intervention Monitor very quickly as they show consistency in answering the newly assigned questions from the improvement practice. In the above example, once the teacher chooses the specific student (s), reteaches the concept, then assigns the practice, the teacher can review the results for valuable insights, as shown below. Next, review the Student Proficiency report to see the details behind the Proficiency Score which has been updated with the new data. If the student has shown consistency in solving the problems, they will drop off! 7. What other supports are available to help SPED teachers keep students engaged? We recommend that teachers in a SPED environment also use key features such as voice read-aloud, coins and rewards, growth mindset and goal in addition to the leaderboard to keep students engaged. SPED teachers typically have smaller class sizes and the ability to customize each student’s experience can be accomplished with just a few tweaks. Stay tuned as we continue to refine this area to provide more accommodations. Is your classroom all set up and ready to go? If not or if you would simply like some guidance, join our webinar by clicking here or schedule a quick 15-minute chat with the team by clicking here. There is always more to learn so don’t hesitate to explore or reach out to our support team by clicking the orange Help button and typing “RTI” or “Intervention” in the search bar.